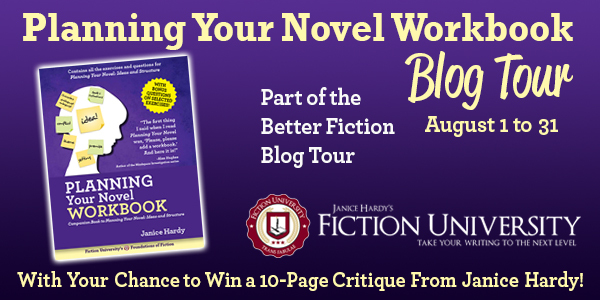 It's my privilege to host Janice Hardy here on my blog today. 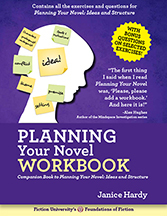 Janice is the author of several fantastic writing resources, including Planning Your Novel: Ideas and Structure, a series of self-guided workshops that help you turn your idea into a novel, and the just-released companion guide, the Planning Your Novel Workbook. Janice Hardy is the award-winning author of The Healing Wars trilogy and the Foundations of Fiction series, including Planning Your Novel: Ideas and Structure, a self-guided workshop for planning or revising a novel, the companion Planning Your Novel Workbook, and the upcoming Revising Your Novel: First Draft to Finished Draft. 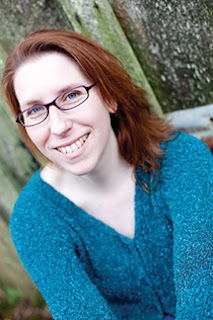 She's also the founder of the writing site, Fiction University. Great advice, I will be sure to use in my WIP. It seems to be sagging in the middle right now. Thanks! Would love to win the critique. Sagging middles were my problem when I was learning, so I feel your pain. What helped me, was to create a midpoint event that shook the plot up and changed things in the story. That broke the middle in half, and the first half was all about getting to that event, and the second half was dealing with the aftermath of it, which led directly to act three and the climax. It really gave the middle direction and some plot backbone to work with. Once again great advice. I will definitely use it to help with my current project. Thanks Janice. I can relate to all of these. I'm working on a second draft and had to dump a bunch of scenes because they did not move the story forward. Good for you for dumping them! Getting rid of what's not working is tough for a lot of writers. YES. I've always found that when my writing is stalled, it's one of the elements of the previous scene that's stopping me subconsciously. Accordingly, once the issue is cleared up, the writing flows as it should...and yes, I've cut entire scenes (without shame) to make that happen. If they're not serving the story, they have to go :) For me, it's almost always a goal issue. Thanks for another great reminder that every scene has to advance the plot in some way! What fantastic and practical advice. What if I find myself stalled at the same place each novel? For example, you might have more of premise novel to start, where the idea is there, but you haven't yet figured out the core conflict so you can't actually plot it yet. So after the setup, the book stalls because you have nowhere to go (since you have no major problem and thus no resolution to write toward). Where are you stalling? That would shed some light on what the problem might be. I love this article. Very informative. It will definitely help me see where I've stalled. this is remarkably well-timed. I've been avoiding going back to my manuscript and am finding all kinds of great, legitimate distractions to keep my from it. Reading this made it very clear that it's simply stalled and that's why I'm avoiding it. Love the lists of questions - that's where I will start when I finally drag myself back to work. Much needed nudge - thanks! Most welcome! I hope it helps get the story started again. I'm revising a first draft and substantially altering the plot—and I'm stuck! Your suggestions are timely and helpful; thank you! Most welcome. If these types of questions are helpful, I actually have a revision book releasing on September 1 (if you don't mind the shameless plug). It's filled with questions designed to lead something through the process and teaching them (or reminding them) what to look for. Ooo, I'm looking forward to that. Another great plotting post to help me sort things out! And - another site to add to my list to follow. Thank you for such a clear, informative post. This is a keeper, Janice. In fact, it's time to tweet this baby. I'm revising my novel, and my Act 2 is stalled before the new twist I'm adding in. My MC has a plan to expose a big secret, but the other three characters think it's a bad idea to mess with those people. My plot needed them to agree with her, so I could then drop the twist bomb and launch them into Act 3. But forcing the characters to act against their best interests made my writing stall. This was a good reminder to step back and look at the motivations of my characters. What would convince them agree with her? Is there a believable way to make that happen in the plot? An excellent checklist to use for each chapter. Thanks again. Great Questions! I have a document I call "Janice Hardy Questioning technique" where I keep a lot of the questions from your articles. They help a lot when I am trying to plot my novel. Awesome tips! I enjoyed reading this very much, and I'm hoping to apply this to my first novel in process, When The Promise Fades! Best of luck! Sending good revision vibes your way. These are fantastic tips. And oh my, the first one had me in giggles! Figure that out and you can retire in luxury :) The mid-point reversal helps me keep my middles structured and focused. Try adding an event or revelation at the midpoint of the novel so you have something to write toward, then something to recover from in both halves of the middle. The middle becomes a nice arc with a high point at the center of the book. In #3 above, by "Why is the protagonist acting?" do you mean: what is motivating the protagonist to act this way, or do that? Yes. What is making them do whatever it is they're doing in that scene. Why pursue *this* goal? What's the reason or motivation? Stalled, stranded, sputtering. All of the above. Thanks for the tips. I needed to read this today -- spent part of yesterday on a scene that brought everything to a standstill. My characters were even confused why they were in it, and I have the dialogue to prove it! And it was a triple threat scene -- elements of your points 1, 2, and 3 all apply to it. Thanks! Glad to help. Hope things are moving once again. 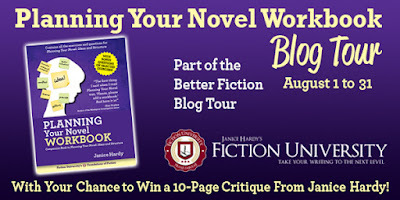 Great tips to those of us in the trenches of our first unpublished novel. I'm already back to the MS looking for lazy, idle and recalcitrant characters who won't do what I want them to do. Seriously, thank you for sharing this. Most welcome :) Hope you don't find too many, but if you do, good luck at pointing them back in the right direction. Janice, You offer the best advice for crafting a great story. Aw, thanks so much :) Made my morning. Great post. I intend to run my stalked scene through it again in the hopes of restarting it. Sending good writing vibes your way! I had never thought about plot in reference to an engine, but it makes a lot of sense. I'm looking forward to incorporating some of these tips in my writing. Thanks Janice! Most welcome :) It really is what drives the story. Currently struggling with books 2-3. All of these reasons it stalled resonate with me, but thinking of the plot as it applies to an engine was particularly helpful! I'm hoping I can get this plot firing on all pistons soon. I hope so, too! Books 2 and 3 can be tough (especially if they're a trilogy). You might try pinpointing your core conflict for each book and making sure you have something external to plot toward. It's common to have the conflicts of sequels be more internal, which doesn't leave you anything tangible to plot toward. If that's your case, brainstorm ways to find external problems for that internal conflict. Happens to the best of us :) At least you know you do it, which makes it easier to deal with it. Great, you point out reasonable list. However, I think if you are the writer rather you won't forget anything especially the plot ang goal. Right? This post is sooooo awesome! My current manuscript, though finished, felt stalled and I had to go back multiple times and changed major stuff to get it going. It seems to be very helpful.I want to exchange lots of information. Please visit once. Thank you.